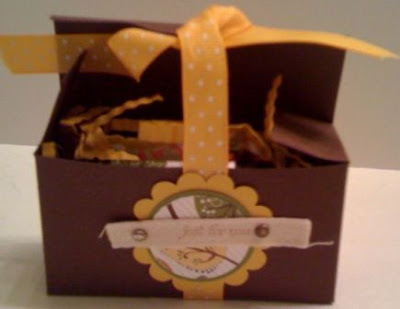 Yesterday I had an awsome downline team meeting at my house and this little box was one of my samples I made to show my team an idea for a door prize. Of course it has Ghiradelli chocolates inside! Yum!!! 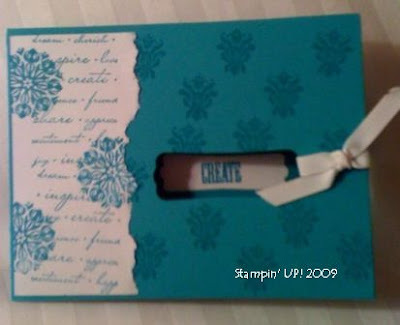 I found my inspiration from "So Shelli's" blog and used different dsp paper etc. This little box was so easy to make with the Big Shot #2 die using chocolate chip textured cardstock; I cut thin strips of Crushed Curry cardstock and put it through the crimper to make shred for the inside of the box; Tall Tales DSP for circle and to wrap the chocolates in; Old Olive CS, Crushed Curry CS, Twill tape, Basic Brown ink, Scallop circle punch, 1-3/4, 1-3/8, circle punches, Vintage Brads, Crushed Curry Polka-dot ribbon. Sign up for my Big Shot class on Sept 8th and you will learn to make boxes too. Email me to reserve your spot. I won this metal candle holder with a bird on it at my regular Bunco Group last week. 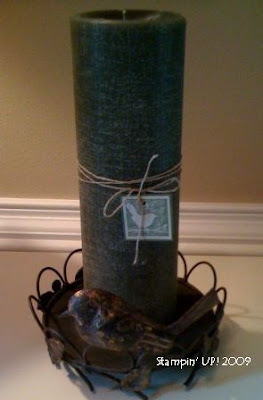 When I got home the only candle that I had was a bit tall so I tried to make it look better and stamped the bird Of the Earth from the SU hostess collection; attached it with the linen thread and sort of dressed it up. Hope you like it. I love to see what type of home décor I can come up with my stamping supplies. Don't forget to check out my classes and events under QUICK LINKS, then click on UPCOMING EVENTS on the left column, it will take you to my calendar on my Stampin UP website. Drop me an email or give me a call to reserve your space. Remember the $85.00 Mini Demo kit is only good through August 31st. You can go on my website today and sign up (my special password is wagstampers). I have a downline meeting on Sunday that you are welcome to come to and I will be planning some training meetings for September. I would love to have you on my team and you do not have to live in my town or state to be on my team. 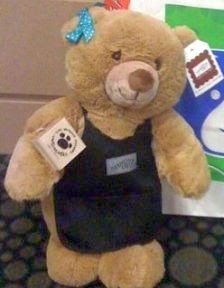 I still have a Build A Bear waiting to go home with one lucky new team member. Contact me for more information!!! I have been playing with my new toys I got from convention and looking at my pictures. I wanted to share a few things with you. This first picture is of Amy Johson my up-up-up line, taken at convention when we bumped into each other. We met a few years ago in Orlando at a meeting and realized we were in the same group. Amy is a very supportive upline to all her team and I am proud to be on that team. 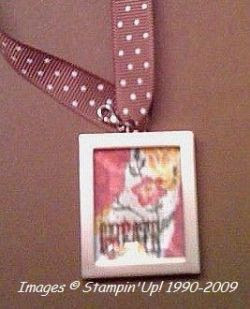 This is a card I made with the Charming stamp set that I won along with my charm from Shelli at convention. There are so many possibilities for using this stamp set I can't wait to play more with it. 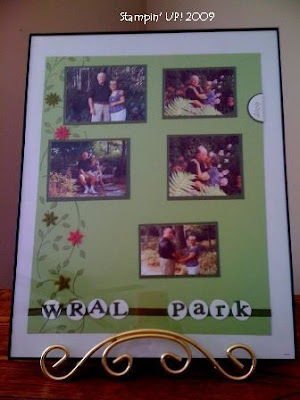 Saturday was my husband's birthday and I bought one of those collage frames to put some pictures in from a photo shoot we did in the park in July for a supprise, I could never get the right size and it drove me crazy and I thought well I can just scrapbook this instead and put in the same frame, so I did and I think it needs some journaling but otherwise we both liked the results. When I was working with the letters/words on the scrapbook page I made several kinds, I stamped some and cut some out from the Naturally Serif die letters from our Big Shot collection and I had all the other letters left over and thought about what to do with them. 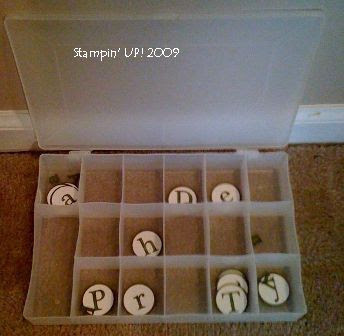 When I was organizing my stamp room I found a container that I used to use for embroidery thread that works perfectly for saving letters that you can use on other projects instead of throwing them away and starting over again. Save space and money and time. Have a great week and stay tuned for new classes and projects. Effective July 1, 2009 the details are: *You can print my "Reward Card" or get one from me and start adding punches. *Each card will have 20 punches and you will be responsible for tracking your own progress. One punch is for each $30 increment per purchase. Loose your card? Need to know how many punches you have? Contact me and we'll get you updated. * Please punch your card for: 1. Stampin'Up! orders - also includes orders placed online at my Stampin'Up! website CLICK HERE 2. Promotions offered by Stampin'Up! *Please do not punch your card for: 1. Class fees 2. Specials offered by me (example Ribbon Shares) 3. 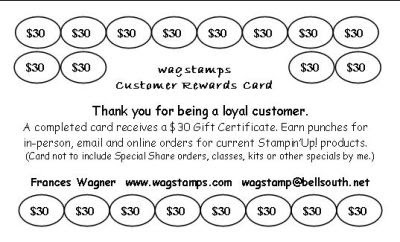 Stamp Kit Orders *Once your card is complete with 20 punches you will receive a $30 gift certificate for Stampin'Up! product. Contact me to redeem your reward. THANK YOU for being my loyal customers! Name my Bear.... The Stampin'Up! 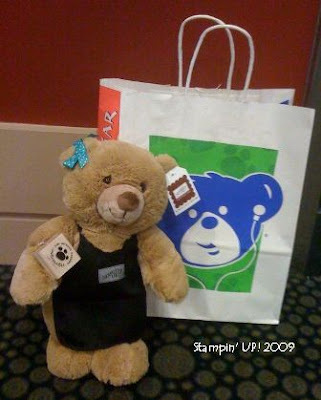 Build-a-Bear that I got at the 2009 Stampin'Up! Convention needs a name, so I am having a CONTEST to name my bear. It has a birth certificate and the name will become OFFICIAL. Email me your choice and I will pick from those entered in the contest and the winner will receive a pack of handmade cards by me. The deadline for entries is August 29, 2009. So put on those thinking caps and name that bear today! CONTACT ME for more information on the upcoming Holiday Mini Catalog. Events for AUGUST 2009 - Sign-Up NOW! AFTER CONVENTION Stamp Camp - August 15, 2009 - Saturday 10:00 AM - 1:00PM $25.00 You will be making 5 projects with new stamp sets! Door prizes and food and FUN. You will not want to miss this. Last minute chance to SIGN-UP NOW! By Thursday, August 13th. Call or email so I'll have your projects prepared. Mystery Hostess Night - August 18 - Wednesday 7:00- 9:00 PM Come make a card and purchase a minimum $25 to get your name in the drawing for HOSTESS BENEFITS (combined sales of all guest must reach $150; when it reaches $300 I will draw 2 names). Have a fun girls night out and you could be the winner. Of course there will be chocolate! Email me to reserve your spot! Under the Stars Class - August 25 - Tuesday 7:00- 9:00 PM $20 Class Fee in advance pre-paid to me to reserve your space. Under the stars card, double 12x12 scrapbook page and 3D project! If you or your family likes the outdoors or camps this is a class you are going to love. Contact me. Downline Team Meeting - August 30 - 2PM My House. Free to members of my Team. Be ready for an exciting afternoon of FUN and learning. See the latest new products and new ideas! If YOU and 5 FRIENDS would like to have a FUN get together, learn a new TECHNIQUE OR TREND, Let's DO IT! CONTACT ME and we can arrange an event at your house or mine! I am so excited to be back from Stampin'Up! 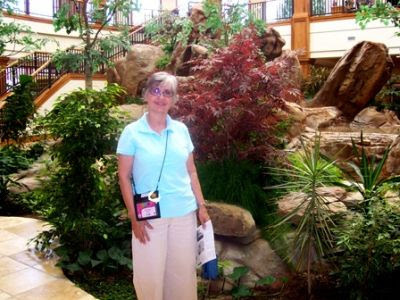 Convention 2009. I have a gazillion ideas going through my head. I had a fabulous time. It was my first time in Salt Lake City, Utah and I had a chance to tour the home office. Wow, if I didn't mind cold weather I would move there and apply for a job. It is so beautiful. This is a picture taken inside the SU home office in the atrium. I am making a scrapbook of my trip. Be sure and ask me to see it the next time you come to an event. I'm sure you will love it. At convention we swapped cards and ideas with demonstrators from across America and Canada as well as attend many presentations and classes. We also took pictures of the sample boards and home decor. For those that know me, you know I love to decorate. This was heaven for me. I also earned an award for recruiting this year. I love it that my team is growing and I am meeting new friends. 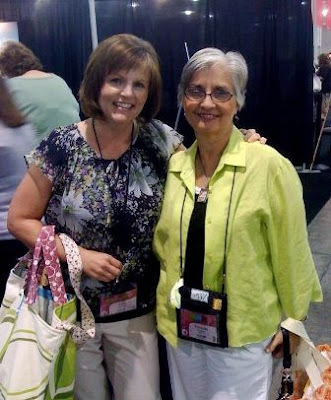 Except for those friends I have made at church, I would have met most of my friends and downline through my stamping business and for that I am thankful and blessed to have each one of you in my life. 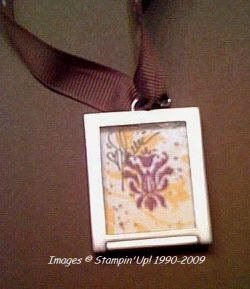 I won a necklace that Shelli Gardner, Stampin'Up! 's (Co-founder and CEO) and her family stamped. These Lockets are one of the new products featured in the Holiday Mini Catalog showing up in your mail box soon. Of coarse, the picture does not do the beauty of a piece justice. You have to see it in person. I'm sure I'll be wearing it or it will be close at hand the next time you see me. It's my new "Pride and Joy". If you don't get the "Holiday Mini Catalog" in the next week or two, let me know and I will arrange to get one in your hands. Ordering starts September 1st. Check back each day and I will tell you about more EXCITING products coming soon. Previews YOU don't want to miss! CONTACT ME if you have any questions. Are you ever at the airport waiting for your luggage to come off the carousel and it seems like everybody there has a black suitcase just like yours? Well in January when I went to SU Leadership conference in Orlando I decided to make my luggage stand out so it would not pass me 3 times before I realized it. 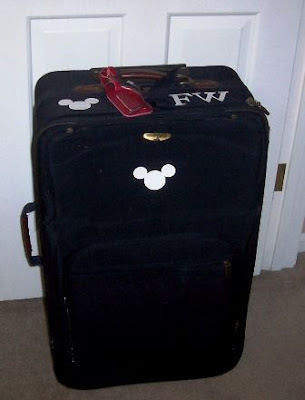 I used the Décor Elements Sheets of Vinyl and cut circles to make Mickey Mouse since we were in Orlando. 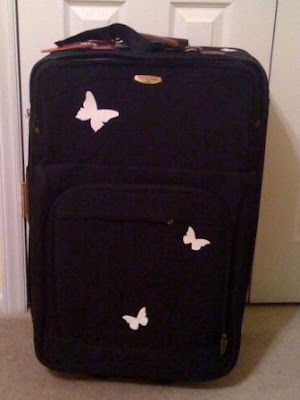 It worked however I am going to convention on Tues and I didn't think Mickey would look to cool in Salt Lake City so I used our Beautiful Butterflies die cut (114507) on page 198 to put on my luggage so I can find it from a distance this time. Hope you like it. This is one of the room mate folders I made for my room mates for convention. I think this one is really cute. What do you think? I used the Tall Tales Designer Paper and oval punches and 12x12 card stock and a manilla folder. JOIN MY TEAM Don't forget you have another month to join my team for only $85.00 for the Mini Demonstrator Kit. 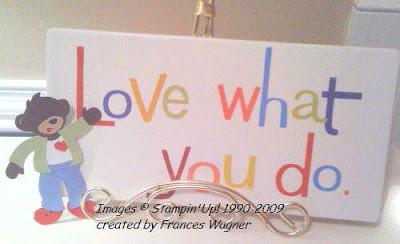 You can join right from my website www.franceswagner.stampinup.net and it is very easy. My password to get to that part is wagstampers so you can sign on. Let me know if you need help and I can walk you through it. REMINDERS: Check my STAMPIN UP WEBSITE for my classes and other events such as MY STAMP CAMP/DOWNLINE MEETING (AUG 15 10AM-1PM). You will be making 5 projects from the new catalog from ideas I learn about this week at the Stampin UP Convention in Salt Lake City, Utah. Email me to make your reservation and you can drop a check in the mail to me. I WILL BE CHECKING MY EMAIL WHILE I AM GONE SO IF YOU HAVE ANY QUESTIONS PLEASE DON'T HESITATE TO EMAIL ME. 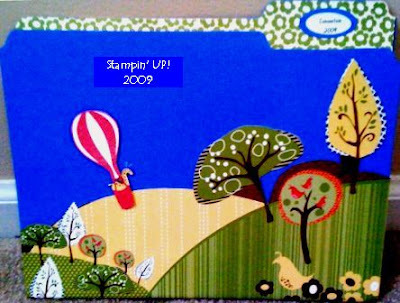 Be sure and check out the NEW STAMPIN'UP! VIDEOS in the right side bar. I'm sure you will love them.